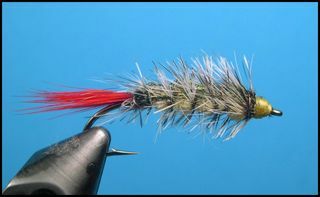 The Bristleback is a great mid-summer fly for Bluegills, Green Sunfish, and Rock Bass. Use the finest copper wire that you can find for the rib. I like Hare-Tron Dubbin because it's a blend of rabbit fur and antron fibers. It is an easy dubbing to use and the antron provides a bright sparkling effect to a dubbed body. 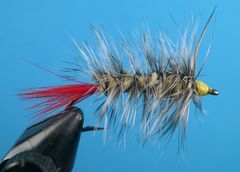 When you're attaching the feather that will be palmered up the shank you can tie it in either wet or dry fly style. If the cupped side of the feather faces the hook the barbs will point slightly rearward. 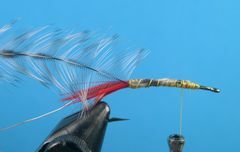 If you tie in the feather with the cupped sided facing you the barbs will point slightly forward. It's your choice. You can counter wrap the copper wire rib along the body but it really doesn't make much difference which way you make the wire spirals. Fish this little guy the way you would fish any other panfish nymph. 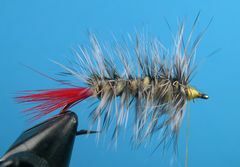 Check out some of the other wet flies and nymphs on this page to learn how I fish them and you will get some ideas on how to fish the Bristleback Nymph. Start the thread slightly behind the hook's eye and lay down a base of thread back to the hook's point. Strip a good bunch of barbs from an Whiting American Hen saddle or neck and tie them in for the tail. Tie in a piece of copper wire for the rib at the base of the tail. 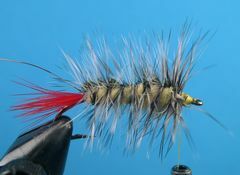 Tie in a Grizzly Whiting Neck or Saddle hackle by the tip at the base of the tail. Tie in six to eight peacock herls directly on top of the hook's shank at the base of the tail. Apply a fairly thick noodle of Hare-Tron Dubbing to the thread and dub a fairly flat body. Pull the peacock herls forward and bind them in. Remove any excess herl. Be sure that the herls are centered on the back. Palmer the Grizzly feather forward with fairly wide spirals. Tie it off and remove any excess feather. Wrap the copper wire forward with four or five wraps and tie it off. Remove the excess wire. Try not to bind down any of the feather barbs as you're wrapping the copper wire. If you do, pick them out with your bodkin. Form a neat thread head and tie off the thread. Coat the thread head with head cement. Remove the fly from the vice and trim it with serriated scissors. 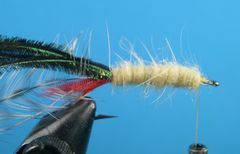 Trim the hackle fairly flat on the bottom and tapered from the front to the back on both sides and the top. 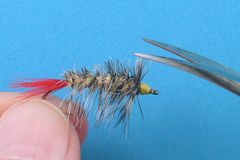 This is the way the Bristleback Nymph should look after you have given it a haircut.